Baselang Spanish Review – Get Unlimited Spanish Lessons Without Any Risk! Today we are going to take a closer look at one of the best Spanish learning resources on Earth. I can confidently say it because people are literally loving Baselang. When I first time stumbled upon their website I was a bit suspicious but I was wrong. You will find the reasons in this review in the next 1-2 minutes. Price: A Trial Week for $1. Afterward $129/month Unlimited Spanish Lessons. Baselang is a service that offers unlimited 1-on-1 Spanish online lessons for a relatively cheap price. I have found out that it’s one of the best language learning services in the world. You can hardly find any negative reviews of their Spanish lessons. Most reviews give it a full 5 stars out of 5. Some people reported that they learned to speak Spanish in a month or two without almost any experience. Baselang has a lot of qualified teachers with a step-by-step curriculum created for you. If you don’t want to follow their learning plan you can also have the lessons in any style you want. They will adapt to your needs. Their curriculum offers also a very effective way of learning Spanish. It goes each lesson deeper and deeper and adds your skills. Isn’t it a great feeling to make progress? Tony Robbins goes so far that he states, “Progress equals happiness.” Progress with Spanish skills at least gave me a great joy. I think that there are many benefits of using Baselang. You can have an unlimited amount of lessons for $129 per month. Sometimes even a single 1-on-1 language lesson can cost up to $50. In Italki or in Preply you can find teachers for a cheaper price. Even as less as $5-10 per lesson. However, you can’t be sure of their teaching skills. Then they have a crazy money-back guarantee that I will explain further in more detail. Shortly, it means that you get a full refund AND extra $20 if you don’t like their services. It seems that people are enjoying so much that they can do it. Baselang doesn’t only offer conversational teaching but they will also give you lots of exercises if you want. These Spanish language exercises will expand your vocabulary, improve your writing skills and grammar. How Fast Will You Become Fluent Spanish Speaker with Baselang? This is probably the most interesting part. Everyone wants to speak Spanish fluently. It’s one of the most spoken languages in the world and benefits of speaking Spanish are huge. You know probably some friends who studied Spanish for years at school but are still not able to speak it fluently. In Baselang you won’t need to spend years to speak Spanish fluently. On their website, they have a calculator that shows an estimate how much time and money will it take to become a highly fluent Spanish speaker by using their services. You can become a fluent in Spanish with Baselang in 3 months. That’s impressive! As you can see in the picture, you can go from 0 to fluent in Spanish in a 3 short months. Of course, it requires that you use the time for learning but there’s a simple formula for you. After this, we can confidently say that Spanish is easy! You can also compare how much money it would take with online tutors from other websites or by using an in-person tutor. If you are wondering if it’s really possible to become fluent in 3 months, take a look what Benny Lewis says in his “Fluent in 3 Months” course (these teachings revolutionized my language learning). What do you think? Isn’t that quite impressive? => Want to Become A Fluent Spanish Speaker? Try Baselang Today! As I saw above, Baselang teachers go through a tough process before getting qualified. Still, they have a good amount of teachers so you can book one almost anytime you want. The founder of Baselang Connor Grooms is a digital nomad which means that he has a possibility to live wherever he wants in the world. His main base in South America. That’s probably one reason why most language teachers in Baselang are Venezuelan. So, they speak Spanish with a Latin American accent. I speak Spanish fluently and I think that Latin American Spanish is usually even easier than Spanish in Europe. What is your experience? I have also read several other Baselang reviews where members reported that their Venezuelan teachers are very motivating, enthusiastic and positive. You can also decide if you want to work with one or with several teachers because you have an access to unlimited amount of lessons. Some members try even more than 10 different teachers because it doesn’t cost anything more. In my own experience, Baselang teachers are incredibly friendly and they do their best to help you master Spanish. 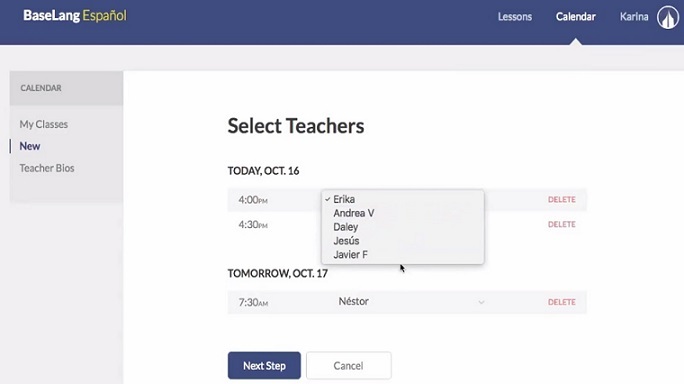 You can also watch an intro video of a teacher before taking the first lessons with him/her. You can scroll between teachers and watch their intro videos before booking lessons. How to Book Lessons on Baselang? You just go to “Calendar” section on your profile and click “New”. Then you will see a window where you can choose your class. There are teachers available at any time of the day. If you want to book one of your favorite teachers, I recommend to do it early because the best teachers are booked pretty quickly. You can always have an overview of your lessons on “My Classes” section. Baselang platform is very simple, professional and intuitive. It’s easy to navigate on their website and find what you want. They also provide a complete walkthrough that shows in detail how their platform works. If you don’t find something immediately, you can always contact Baselang support and they’ll help you out. Booking teachers through Baselang are fast and easy. Does Baselang Have a Curriculum for Teaching Spanish? Yes, they have. There are 10 levels in their curriculum from 0 to 9. 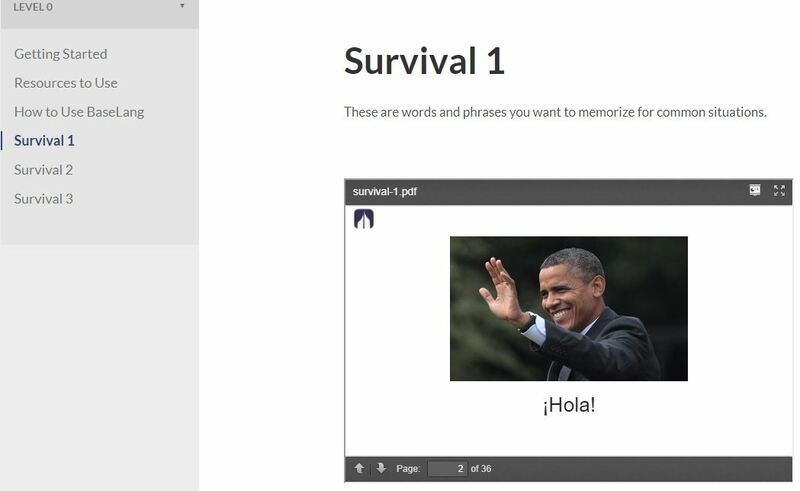 Level 0 is a survival Spanish. You are just getting started and learning a few most basic words. At levels 1-3 you will build your foundation and basic knowledge of Spanish. You’ll master lots of new vocabularies and learn Spanish pronunciation. In the beginning, you don’t have many conversational classes because you need to first build your vocabulary. When you move forward and build up your skills, you can have more conversations with your teacher. Levels 4-6 are intermediate. You’ll deepen your skills on Spanish grammar, expand your vocabulary and have even more conversations in Spanish. Levels 7-9 are advanced. At this stage, you’ll learn even more vocabulary and learn the last bits of grammar. Your pronunciation will be great and eventually, you’ll become a fluent Spanish speaker. You can start each lesson from the subject that you were left last time even though you would have a different teacher. Baselang teachers take notes on your learning and write it on their own platform. So, even though you would start with a new teacher, he/she already knows your level and the things that you are studying at the moment. Baselang has a great curriculum. It’s created by Spanish teachers who have years and thousands of hours of experience in a total of teachings Spanish. However, you can also have totally customized lessons to suit your needs. If you just want to have a Spanish conversation or practice some individual things, that’s totally fine. Baselang uses flash cards, in the beginning, to help you to learn new vocabulary. At levels 7-9 you have an opportunity to practice even the most advanced grammar of Spanish. Baselang pricing has received lots of praise. For $129/month you can get so many lessons as you want. Let’s imagine that you take 100 lessons in a month. It means that you will pay only $1,29 per lesson. In addition, with that pace, you will become fluent faster than you had ever imagined. You don’t need to pay $129 right off the bat. They offer you a one-week trial for $1. Then you can comfortably take a look and immerse yourself in Spanish without any risk. They have a crazy money-back guarantee that I already mentioned above. You can try their services for 35 days without any risks. If you are not satisfied, Baselang will give you all of your money back and an additional $20 for “wasting your time”. That’s insane! I don’t know many other companies that would go so far to provide a full customer satisfaction. Baselang CEO is quite special. He doesn’t speak 16 languages like Steve Kaufman (the founder of LingQ) but he has many other impressive characteristics. He achieved a freedom to live wherever he wants by young age because he succeeded with his businesses. Afterward, Connor hasn’t wasted his freedom. He has taken many crazy 1-month challenges during the years. He gained, for example, 26 lbs of muscle in one month with a simple plan and effective execution. Then he also learned to speak Spanish himself in one month. He has made a documentary about that challenge which you can see also on YouTube. I attached the video also below. When I am writing this article 24.6.2017, his documentary has been watched more than 770,000 on YouTube. In my opinion, the subject is very inspirational. Let’s sum up the pros and cons of Baselang. Conclusion – Is Baselang Worth It? I think that the answer is obvious. I don’t find a single reason why Baselang wouldn’t be worth it. The only exception is if you don’t have enough time to take the full benefit out of their unlimited lessons. Then you could consider having lessons through Italki or Preply. I offer $10 sign up bonus for new Italki members and 30% discount for the first lesson in Preply. But if you have time to invest into your Spanish learning and you want to become fluent, I would go to Baselang. I am wondering if there are also similar services for other languages like French, German or Chinese. Do you know if they exist? Because I would like to try them. What do you think about Baselang? Do you have experience of their or other Spanish tutoring services? Let me know in the comments below and I will be more than happy to reply you personally! Thank you for this information, I’ve been looking for similar articles like these. How would you compare this program to Rosetta Stone? I know that this one is fairly reasonable in terms of price(my opinion) and I’ve heard that Rosetta Stone is a lot more expensive. My story is a bit ridiculous, I’ve taken Spanish in school year after year and I still don’t know it. No one else’s fault but mine, but let me know your thoughts when you can. I know that Rosetta Stone had massive advertisement campaigns in the U.S. which is the reason it has been very popular there. However, I think that it’s a bit overpriced compared to other services. Of course, some people prefer using it compared to others and that’s fine. I think it depends more on personal preferences than what’s absolutely better than the other. But my opinion is that Baselang beats Rosetta Stone. Nice! thank you for linking me to the Rosetta Stone article also! Let me know if I can help you further with language learning. This sounds like a good opportunity to learn Spanish as you get your own personal tutor and really cost effective. I have tried on and off for years to learn the language but have always given up when it gets too hard, that’s why it is good to use a service like this to get the support you need. I am sure that Baselang would help to move forward and not to give up. You will make progress all the time and learn new things. I think it’s much more exciting to keep on going when you are doing it with other people. In Baselang you have wonderful teachers who are motivating you to learn even more. I like the idea that you can become fluent in 3 months. I’ve been studying Spanish (on and off) for about 20 years and I still can’t speak fluently. I see that the cost is actually less in the long-run because you won’t have to pay for a long period of time. Might be worth a look! yeah, Baselang service is amazing! They’ll offer you a full support and unlimited lessons for becoming fluent in Spanish in a record time. If you have used 20 years for studying Spanish and still didn’t become fluent, I highly recommend trying Baselang. You’ll be surprised how fast progress you’ll make. I totally agree with you. Latin American Spanish is way easier than the Spanish in Europe. 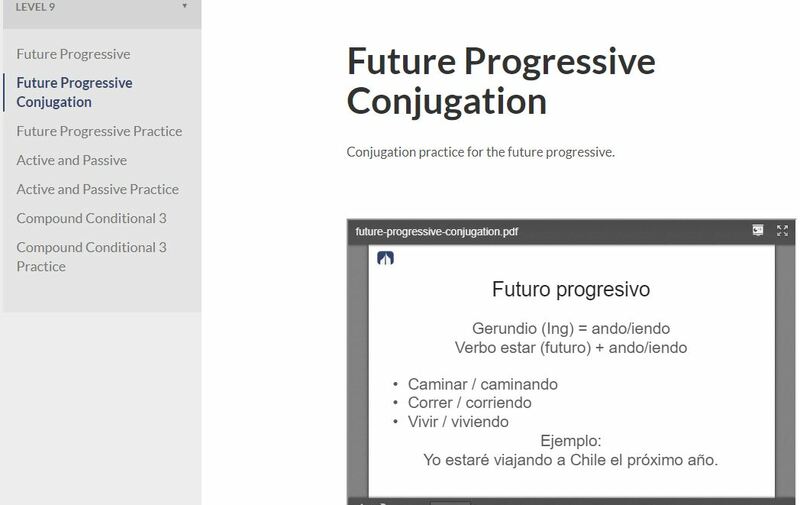 Even if the internet connection is not as good as Europe’s, I feel that it will still be easier to learn with a Latin American teacher regardless. I really like the fact that you can book any time of day for your 1 on 1 lessons. This is great for people who are busy. Thank you for putting this together for us! It was a great read. yeah, Latin American Spanish sounds more simple to my ears compared to European Spanish.That’s one reason why it’s great for Spanish students to use Latin American teachers. I always wanted to learn Spanish, but I didn’t have the time for it. Today, I work less than I used to and my children have grown up as well. My first language is French. So my question is, will it be easier for me to learn Spanish because both languages are Latini and are very similar? For sure it’s easier for you to learn Spanish because you already speak French. There are tons of similar words. Many times you can just think about a French word and pronounce it in a Spanish way. It still requires practice and repetition that you’ll master the vocabulary and pronunciation but you have a great advantage compared to people who don’t speak French. Thanks for sharing the info! I have been trying to learn Spanish and Japanese for some time now and I have found most courses online too hard for me but Baselang seems to have good reviews, so I will definitely check the trial version first. By the way, Do you know any good Japanese courses? I can definitely recommend having a Baselang trial. You can have 7 days for $1 or even 35 days without any risk. Several language gurus and polyglots are recommending Baselang services and I enjoyed their teachings as well. For Japanese and also for some other languages I recommend taking Benny Lewis’ Fluent in 3 Months course. This is a great blog post. I have just recently started studying Spanish and would like to improve at a faster pace. I’ve only been using Duolingo so far but have started looking at taking online lessons. While baselang sounds great, I don’t know if I’ll have time to get the full value out of it, so which out of Italki or preply would you recommend? I understand. You can always take a free trial on Baselang and see how things work. Then you can come back when you have more time. Preply and Italki are both great. I recommend trying them both and see which one you like more. You will get some bonuses through my website. For example, $10 bonus for Italki and 30% discount on Preply through my links. Roope thank you so much for this information! I have been looking for a program like this for my teenage daughter who has problems with Spanish in school. I also would like to begin taking Spanish lessons myself and I believe that this program is ideal for my household. Thank you for this thorough review. wow, that sounds great. I am happy that you found my Baselang article at the right time. It will be for sure help you and your daughter to become fluent in Spanish. I really liked your blog post. Spanish is one of my favourite languages. I used Duolingo a long time ago to learn the language but after a while i stopped. My time was limited. Baselang looks promising so i am going to give it a try maybe in the near future. I am going to agree with you on the benefits the Spanish Language has. Many countries language are based on Spanish. Speaking of countries i have a question for you do you think Chinese is the second most important language everyone should learn? This is what everyone around me is suggesting to me so i would love to read your opinion. I’m sure you’ll love Baselang. All reviews you can find are solely positive and my experience of their service was also great. Exactly. Baselang is my #1 recommendation for learning Spanish. This is an awesome post. Great resource for learning Spanish. My country once occupied by Spaniards over 300 years ago and since then I dream about learning their language in order to understand fully our history. As i also said in the other comment, I’ve always wanted to speak fluent spanish. It have been watching a lot of spanish shows on tv and the language is just satisfying. I will try these lessons for sure and i’m really looking forward to learn spanish, as it’s one of my favourite languages. This article is really helpful for me! I agree with you that Spanish is a beautiful language. I also enjoy listening and speaking it. Baselang will for sure help you to become fluent in Spanish as it has helped thousands of other students. Their teachers are encouraging and interested in helping you to learn more. Thanks for this information. I really want to learn Spanish. I’m sure Baselang will help you to learn Spanish. You can try it for free. I agree the main tool to learn how to speak a language fluently is to actually speaking it. Taking a few classes in college might help you with to understand the grammar and syntax but it won’t give you the required experience to become as fluent as you could be with constant practice. I haven’t tried this program, but interacting directly via video with native Spanish speakers sounds like a big plus for the program. I personally feel that Spanish itself is a language that can indeed be learned in a few months with enough practice, effort and the right program so I don’t doubt their claims. In fact, one of the hardest elements of Spanish for native English speakers is probably the pronunciation so classes that force them to actually speak the language sound great. You are right. Classes “force” you to speak in a positive way. Teachers encourage you to use Spanish to talk with them. In my opinion, Baselang is the #1 resource for learning Spanish at the moment. This is the perfect post I’ve wanted to see because my father lives in Spain during summer and he gave me motivation to learn this beautiful language as well. Having an intensive discussion with your personal tutor takes the cake. Baselang reminded me of my days as an online English tutor for Chinese and Nipponese students. Just like in Venezuela, the internet connection in the Philippines is not really the best but somehow, I managed to make it work. In my opinion, the best way to learn Spanish or any other language is by interacting with its native speakers whether face to face or thru the internet. But of course, having to speak with native Spanish speaker with formal training and proper lesson plan is definitely a big plus. I think Baselang can be even more effective than living in a Spanish country or talking with a “regular” native speaker. With Baselang you can take unlimited lessons with professional native speakers who have a clear plan to you help you to become fluent. To be honest, I don’t know any more effective way for learning a new language than this. I agree with you that investing in Baseland to learn Spanish in the fastest and best way that you can is not only sensible, but also convenient and practical. I haven’t heard of them before when I tried learning Spanish. I know a few words because we speak some in our own dialect, but being able to fluently speak the language is a dream for me. They seem to have very interesting and effective teaching styles and tools that it’s no wonder they get many positive reviews. Spanish and English are very similar so you’ll learn Spanish quickly if you want. When I speak Spanish I don’t often even need to remember the word. I just use the English word with the Spanish pronunciation and it’s exactly right. For example, “pronunciation” in Spanish is “pronunciación” and there are thousands of similar words. Okay. My goal isn’t even to get an original accent because it’s not necessary for the best communication. I am not thinking to start learning Spanish anytime soon, however, I have been always interested in this language. Even if I want to get started immediately, I might never use this program because paying $129 every month is beyond my budget. You will not learn a new language in one month. You will have to spend at least 3 months. In three months, I will be spending a lot of money. I understand that the price may seem high at first but think about it in this way: If you take, for example, 2 lessons per day (you can take much more if you want) it equals to 60 lessons in a month. That makes the price only around $2 per lesson. I believe you can get nowhere so cheap lessons. The other advantage of Baselang is that it saves time and time is money. If you have more time available, you can spend it doing this you love or working if you want to make more money. I had not thought about this. Paying $129 per month might look very expensive at first glance. However, if I concentrate on the money spent on each lesson, the program looks relatively cheap. Furthermore, if I have to attend a traditional language school, I will have to spend more time and money. True. At firs I also thought that $129 looks very expensive but then I realized Baselange could be even the cheapest way to learn Spanish. Well, I speak it already fluently so I don’t need it anymore but I hope there would be similar services for other languages as well. This is my first time to have interest in learning other language. I feel like I’m interested in learning Spanish. Seems like there’s a similarity with native Philippine language. International schools has a curriculum that they should choose either French, Mandarin or Spanish as their second major subject. Now, I got an idea where my daughter could refer for advance learning and so am I too. Yeah, I’ve heard that there are some similarities between your language and Spanish. I have never studied Tagalog because it seems that usually all Filipinos speak English. Therefore I don’t really see a big need for studying it at the moment. I think it’s the same like in Finland (my home country). Almost all Finnish people speak English so you don’t really need Finnish unless you want to work there in certain jobs. Baselang is certainly an awesome resource for learning Spanish. I can honestly recommend it for you, your daughter and anyone else. And again @Roope what a great article, I’m hugely influenced by this one. Of all the foreign language of several countries of the world, it’s only Spanish language that I crave to knowing how to read and write it perfectly 100%. From the look of things, it’s quite obvious that Baselang are pretty good at what they are doing. And to actually having to pay and have an unlimited amount of lessons for just $129 per month, it’s really a good deal to me. You’ll be able to learn Spanish fast because you already speak English. There are so many similar words and phrases. Many times you just need to know the English version and you can already guess the Spanish version. Baselang will help you for sure. The only exception isn’t just not having enough time to take advantage of the full packages with baseleng, I think it also has to do with the cash. Some people might find it a little on the high side though I think it’s quiet cheap in comparison to other sites and platform. Asides all said above, I think baselang is a welcome idea. 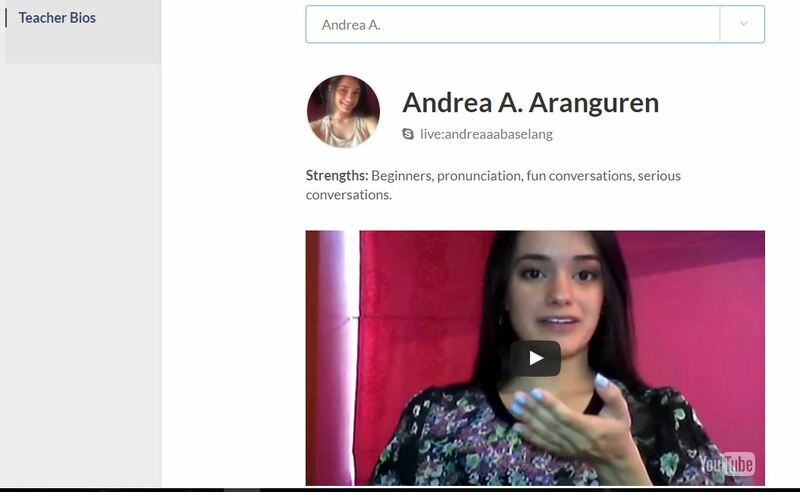 Not too many platforms can boast of teaching someone Spanish from the scratch to fluency in just three months. So if your conclusion is anything to go by, I think they are really doing a great job with everything. Yes, Baselang is great if you have time and you want to become a fluent speaker fast. For those people who only take 1-2 lessons per month, Preply or Italki are better. I would love to learn Spanish language if I have a chances or opportunity comes. And I would to travel and visit the wonderful place in Spanish and at the same time I will find those famous school their where I can learn Spanish language. You have better resources to learn Spanish than ever in the history. Baselang and other resources on the Internet will make you fluent faster than you think. Of course, you can go to a Spanish school but most likely it will cost much more and be also a slower way.